Favorite quotes: "I will teach you something useful" ; "I can see the ending"
Keima Katsuragi, the protagonist of the story, is a 17-year-old high school student attending Maijima High School Academy. At an early age, he acquired an obsessive interest in video games; now he is known as "The Capturing God (落とし神, Otoshi-gami?)" in the gaming world for his legendary skills in "capturing" any girls in dating sims. But ironically, he is called otamegane (a derogatory portmanteau of the two words otaku and megane-"glasses") by almost everyone in his school due to his extreme devotion to videogames. Despite himself saying he likes girls, it's the perfectly theoretical and beautiful girls of the game world that he prefers, not the girls in reality. His love for games is such that he even goes into withdrawal if he doesn't play games enough and he has the bad habit of locking himself in his room and playing games for days on end when he's depressed. At the start of the series, Keima becomes a collaborator for catching runaway spirits when he replies to an instigative e-mail to his mail address in his PFP (otoshi-god@zumcities.co.jp) requesting his help to "capture" girls without knowing it was a contract from Hell, to which Elsee appeared and asked for his aid to "capture" girls in real-life. For each individual of the "Capture Targets"—a girl with the runaway spirit in her—Keima utilizes his analytical skills and experiences from dating sims to "capture" them. When he has figured out the final push needed to "capture" a girl (in both reality and games), he says the catchphrase "I can already see the ending." Whenever he isn't capturing runaway spirits, he is almost always seen playing video games on his PFP (a parody of Sony's PSP), which might explain his weak physique. Also, despite the fact he even plays video games in class, he is still at the top of class in every subject. During a scolding of a teacher for his gaming habits, Keima reasoned that all would be fine as long as he aced all his exams; he then proceeded to do so, demonstrating a great academic ability. 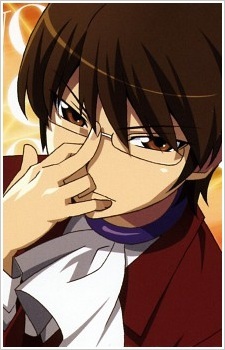 It is shown that Keima's analytical skills he utilises to "capture" girls is also applied by him in his studies, proven true when he flawlessly predicted the questions on the upcoming English test based on the teacher's personality and the examination extent. As the story progresses, his perspective of the "real world" girls becomes different. Nevertheless, he remains faithful to his "2D girls," in particular, a girl named "Yokkyun" who seems to be drawn in a parody style of famed visual novel Kanon. His mastery and devotion to girl games was revealed to be way higher above than just average otakus. He is able to play six games at the same time with each of different screens with the activation of his 'Capturing God Mode.' His PFP breaks numerous times during the series, but later found that he actually has a lot of spare PFP hidden around his body. He frequently does lengthy lecture on various archetypes of characters and philosophies on capturing girls. However, he is completely ignorant to everything else, including real girls and their body, foods and even his own life. Recently he was 'recruited' by Diana to help find the Jupiter Sisters who might reside within the girls he has encountered. In order to find the goddess(s) more quickly he plans to make his move during the upcoming school festival. During the course of the story, Keima is sometimes portraying characters from other comic series. Some of them are Snoopy, Pikachu, Lelouch from Code geass, or even Shinji from Evangelion. And a small gag came to him when Yui and Keima switched bodies. In which he got addicted to playing Otome games (lit. Maiden games), games meant for girls in which you capture guys, rather than his usual games of capturing girls. It's hinted at chapter 189 of the manga (and final episode of Megami-hen arc) that Chihiro was his first love, and at chapter 267 he confess his feelings to her. He likes to present things in numerical manners; such as saying that he has seen certain type of girl 300 times in games. His first name is derived from the term "gamer."